All stickers sold on this site will have no packaging. 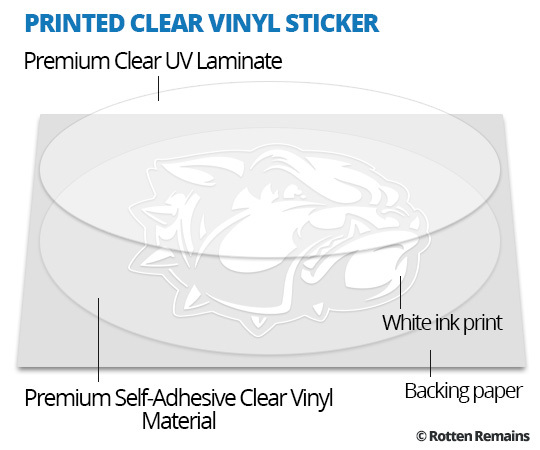 Depending on the size of the stickers and the quantity of stickers ordered, the stickers may be shipped as singles (1 sticker) or as 2 or more stickers on a sheet (view example image below). Our full color stickers are printed with UV fade resistant inks on commercial grade, durable vinyl that has a thick paper backing. The stickers are cut through the vinyl, but not the paper backing. The extra paper backing protects the edges of the sticker from damage. Each individual sticker can be peeled off from the front and applied to almost any surface. These durable stickers are protected from scratches, rain, chemicals and sunlight by a premium, crystal clear UV fade resistant laminate. The pressure sensitive adhesive is on the backside of our stickers typically for placement on the outside of a window or surface. Sometimes known as vinyl cut stickers, vinyl lettering, vinyl decals or rub on decals, our transfer stickers make it easy to apply the most intricate designs to any surface. These stickers are extremely durable and ideal for indoor or outdoor use. 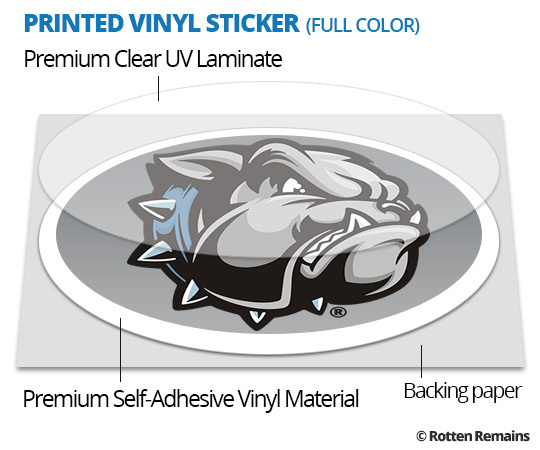 Vinyl cut stickers are covered with a semi-transparent transfer tape that holds the pieces of the sticker design together so that it's easy to apply to almost any surface. 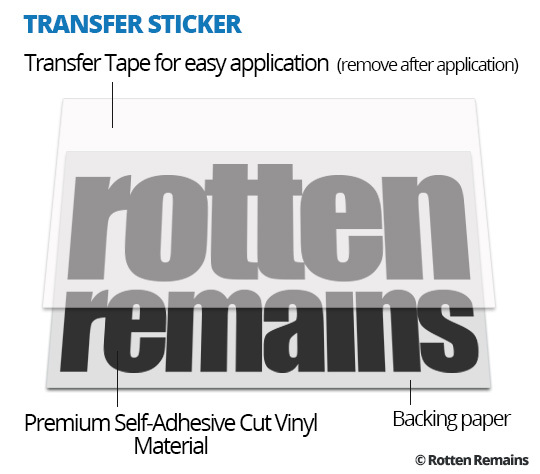 The transfer tape is removed and discarded after application leaving only the vinyl sticker on the surface. All sizes listed on the site are approximate. If there is only one size stated, it is the approx. measurement of the longest side. The image provided below is an example of how different sticker shapes are measured to determine approx. size. All of our stickers are UV resistant, waterproof, chemical resistant and scratch resistant. Rotten Remains makes every reasonable effort to display the products on rottenremains.com as accurately as possible. Various factors, including the display/color calibration settings of your computer monitor, may affect what you actually see on your computer screen. Rotten Remains is not responsible for the display of any color or detail of our merchandise on your computer screen and cannot guarantee the accuracy.